All Slots Casino Canada is one of favorite Canadian casinos for slots players as they offer more than 600 different casino games with the majority of them being slot based games. Players from Canada can access the Microgaming software at All Slots Casino by downloading the software, or play in their browser with the Flash Instant Play version with their cell phone be it iOS or Android. All Slots Casino Canada is owned and operated by the Jackpot Factory Group and licensed by the Malta Lotteries & Gaming Authority with an eCogra certification to prove its legitimacy and secure gaming. The best thing about this casino is that Canadians can deposit in their own CA dollars in many of the friendly deposits to play Microgaming powered games. All Slots Casino payout percentage is 97.81% and is an award winning Canadian friendly casino with the Best Slots Casino award in both 2007 and 2008. In total there are over 700 games to choose from and out of which there are 400 slots games which include classic 3 reel and fruit machines to more than 100 popular 5 reel video slots all loaded with fun, special features like the wild and scatter symbols, free spins and bonus games. All the games are powered by top notch Microgaming software where you can enjoy Microgaming progressive jackpot mega win games which are 16 in number, like Major Millions, King Cashalot, or Mega Moolah with your PC or cell phone. If you do not wish to play individually the casino has slots tournaments to enjoy from time to time where you can compete with other players. Besides slots you can play a lot of table games (50 in total) with so many of versions to experience specially in Blackjack and Roulette. You will find more than 40 versions of blackjack and roulette has American, European, and French roulette, but also multi-wheel roulette and Roulette Royale with a progressive jackpot. You can go for Live casino with live dealer games (over 8 tables) and have the feel of real casino world by playing again some of the finest table games like blackjack, roulette, or baccarat. Other poker games, arcade games, keno, bingo and lotto games too can be played here. 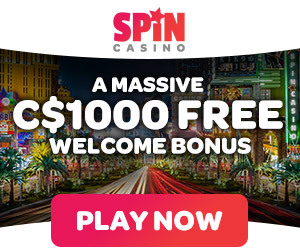 As a new player you are offered CA$1500 as welcome bonus at All slots Canadian casino. Open your casino account and make your 1st deposit. Getmatch your money for up to $500in bonus cash! The All Slots Casino has become well known for their expansive offering of slots tournaments with low or free entry fees and start times every 15 minutes. In addition to accepting the United States Dollar, British Pound and Euro, All Slots Casino Canada also accepts deposits and withdrawals made in the Canadian Dollar. Also provides Canadian friendly customer support in both English and French – perfect for the Canadian players. Also there are loyalty points if you play new games to add to your bonuses. Based on your play, many other valuable rewards, including special bonuses and other player benefits are also awarded. From your very first day, you become a member of the casino’s 5-tiered Loyalty Club, starting at the Bronze level, but with the opportunity to work your way up to Silver, Gold, Platinum, and Diamond. Beginning at the Gold level, you get your own personal account manager along with other exciting extras like luxury gifts and free spins. Platinum and Diamond level players also enjoy higher deposit and withdrawal limits, and some players receive even more great rewards like special weekly deposit-based bonus offers and customized vacation packages. The casino offers various friendly methods for Canadians to make a deposit to play at the casino and withdraw their winnings. If you don’t find PayPal as your deposit option, it doesn’t mean that you cannot make a deposit in CAD. The main methods of deposit include, Credit cards like Visa and Master; Skrill, Neteller, Instadebit, UseMyFunds, Eco Payz, Entropay and others. You can find here at the banking section more about these methods. Also withdrawal methods include by cheque and other mode of payment to the winners. You can have withdraw and deposit in CAD dollars. Also there are other currencies to use at this casino as being a global player it supports almost most of the used international currencies so no worries on that. The state of the art encryption insures that all of your financial transactions are completely safe and secure. Customer service at AllSlots Canada Casino is available 24 hours a day, 7 days a week and in both French and English. There is a separate toll free telephone number 1-888-328-3614 just for players from Canada and an email address with response times typically around 2 hours. You can email at support@allslotscasino.com You can find about more toll free numbers here. The casino offers FAQ page for you to have general answers to most of your queries that you may wish to know.